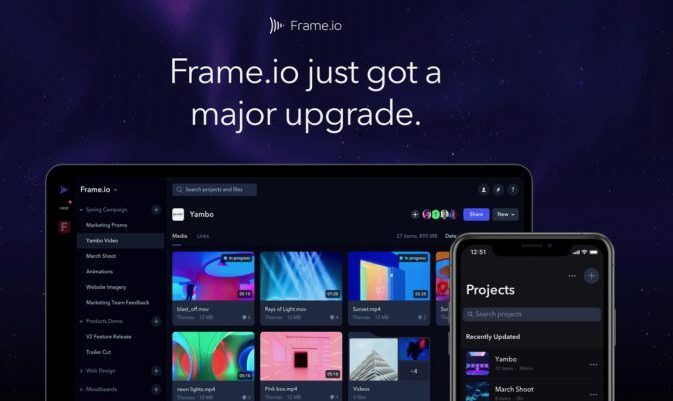 Frame.io has grown substantially over the last four years as the de-factor video review and collaboration platform entrusted by 650,000 filmmakers and media professionals worldwide, and now in its March 2019 Update the platform adds 10 new features designed to make it even easier for users to get work done. Some of you recall a few months ago, Frame.io unveiled their Frame.io in Final Cut Pro X, which is an innovative workflow extension that combines the core functionality of Frame.io with the advanced editing tools in FCP X. This update came hot off the heels of another major update to the platform earlier this year, which we covered in our IBC 2018 coverage when we caught up with Frame.io in Amsterdam back in September 2018. The March 2019 Frame.io Update comes just ahead of NAB 2019 an adds frequently requested new must-have features such as @mentions, archival storage, short links and multi-page PDF support, that will surely contribute to a much smoother collaboration experience for users. Working with all types of creative assets is an important aspect of the video creation process. The new multi-page PDF support allows users to review scripts and storyboards, just like video. Users can now re-order and remove versions from a stack, all from one simple place. Users can now separate internal team conversations from client conversations. Finally! With @mentions, users can tag anyone on a project to quickly grab their attention when it’s needed most. Archive is a new, low-cost storage tier. Free up more account storage by archiving projects. Original files will be archived but low-res preview files stay online and are searchable so users never have to wonder which backups are where. Comment, compare, share—all the Frame.io magic still applies to archived projects. Originals can be restored within a few hours. Note: Feature currently in beta and is not yet widely available. If you have an existing Frame.io account and would like to request access, please fill out this form to request early access. iOS app just got a design overhaul. Users can now enjoy a cleaner and all-around improved interface. Users can now drop all assets into a filmstrip format for easy, laid-back viewing. Complete with built-in autoplay. all-new review pages have a simpler interface that makes it easier for clients to leave feedback—no login required. Frame.io share URLs used to be really long, but now their new f.io shortlink allows users to URL’s in a much more user-friendly way. For users with multiple accounts, Frame.io have now made it super simple to switch between accounts via the new account switcher. The team at Frame.io is headed to NAB 2019 (7-11 April) and they also hint at announcing more updates at the show. Head over to Frame.io for all the latest details.